Well the lovely Leonie from the facebook site of ThermoFun has done it again!! Here is her latest offering which she put together with some help of her Thermofunkies. So just how fabulous are our ThermoServers?? Check out the below list for a run down on some of the things you can use your ThermoServer for. Can you think of any more?? * Baby food – great for heating up so no need to microwave. Just poor a few centimetres of really hot water in, put the bowl in the water and the lid on for five minutes and its perfect every time. * BBQs – keep cooked meat hot. * BBQs – use for an ice bucket. * Bread dough by placing dough inside server OR fill with hot water and put lid on – then put your dough wrapped up in the Thermomat to sit on top – lovely warm spot for the dough to do its job! * Freezer safe? – Yes they can go in the freezer – but if you are making ice cream, don’t put the lid on for 2hrs later, mix will still be warm, not frozen and ready to churn! That’s how good they are…. Soooo well insulated, even keeps stuff warm in the freezer! * Keep meals hot such as: rice, curry, pasta, risotto, steamed veges. * Keeps the meal hot for when family members are eating at different times due to other activities or working late etc. * Oven safe? – NOOOO! * Pancakes stay warm until all are cooked so then the family eats together. * Picnics – keep any kind of salad or fruit salad cold. * Put your uncooked rice into the basket and boil the jug, pour over than add the base as the lid and let it sit while you’re cooking your curry in the TM. * Risotto – leave in for a few minutes to absorb any liquid. * Setting the rice pudding. * Tortillas and wraps – keep warm as they need resting or they will break when you roll/fold. 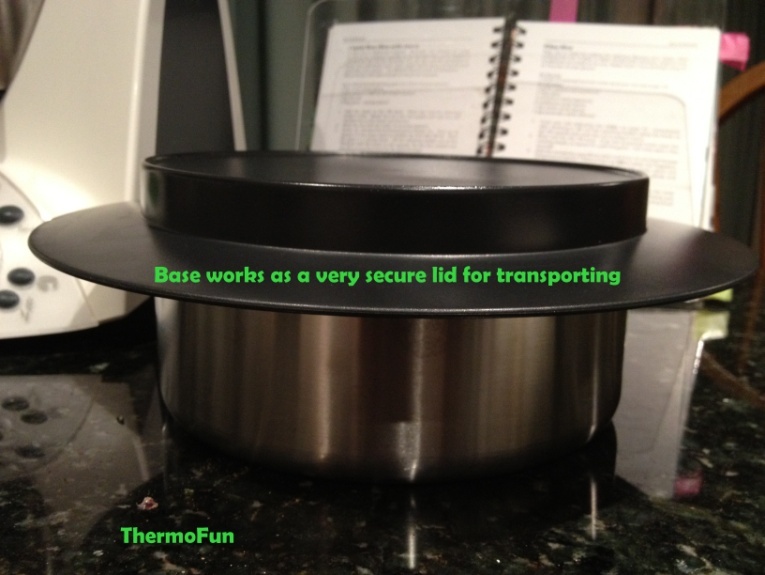 * Transportation: if you are taking it in a car full of food – the base works as a much secure lid so no spillage! * Varoma – Keep the cooked Varoma food warm by placing the Varoma on top of the thermo server, when too much food is in the Varoma to put in server. TIPS: As the ThermoServer is stainless steel, you may wish to pre-warm it with hot water for a few minutes prior to using it for hot food. For Leonie’s extra tips head to href=”http://thermofun.com”>ThermoFun and join the club! 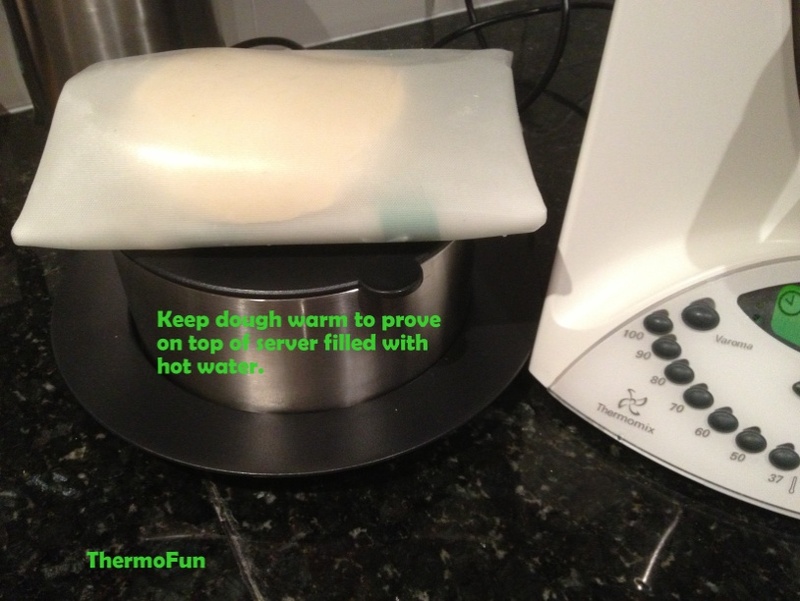 This entry was posted in Thermomix Tips and Hints, ThermoServer and tagged Thermomix, ThermoServer, ThermoServer uses. Bookmark the permalink. How long does the ThermoServer keep food hot for? 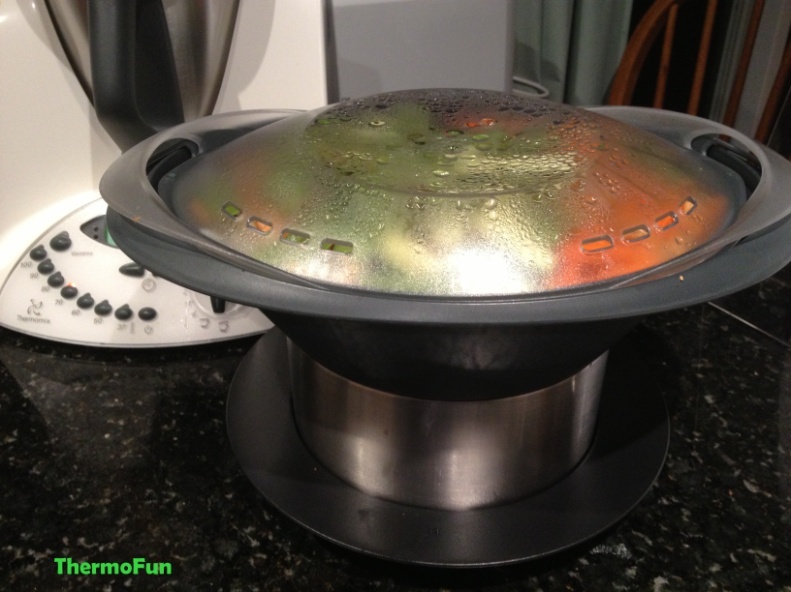 The ThermoServer is amazing…it keeps food hot or cold for up to two hours. DO you know if I can buy just the thermo seve? Where can I get it?